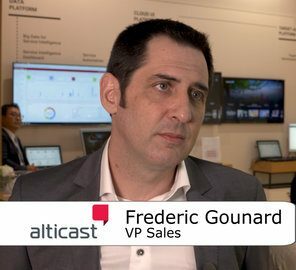 Alticast is an end-to-end provider for OTT services; UI including voice, VoD, catch up, linear. Most often Alticast deals with broadcasters and service providers in transition and guiding that journey enabling the transition alongside legacy services is key to their proposition. Getting it right is more important than getting it quick, says Frederic Gounard, VP Sales, Europe.